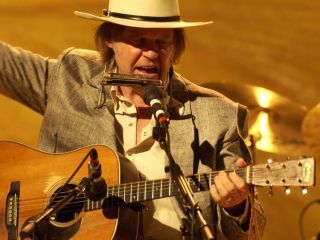 Neil Young has announced the dates of an extensive tour of North America this autumn. And to that, all we can say is, "Hey Hey, My My." The Rock And Roll Hall Of Fame inductee will be joined by the same five-piece band that toured with him recently in Europe (Ben Keith, Rick Rosas, Chad Cromwell, Anthony Crawford and Pegi Young) and it is said that his set list will draw on new and classic material. Death Cab For Cutie and Everest will open from October 14-November 5, and Wilco and Everest are set to open November 29 through December 15. The tour begins in Saint Paul, Minnesota on October 14 and will hit cities including Vancouver, Los Angeles and Chicago before concluding at New York's Madison Square Garden on December 15. All shows for this tour will be GA floor with reserved seating in the stands. GA tickets will be priced at $75.00 with reserved stand tickets ranging in price from $45.00 to $250.00 (plus all applicable service charges, natch). For complete tour and ticket information visit Live Nation or Neil Young s website.